After 8 months in development, the Thunderbirds Stage Show opened at the Chancellor Hall, Chelmsford, on 15th April 1974. The show was presented by "Stage Three" - Christine Glanville, Rowena White and David Ross. The puppets (rod puppet versions of the original TV series marionettes) were made by Christine Glanville and costumed by Rowena White, who also wrote the script. David Ross supervised the design and construction of the show's 16 stage sets and recorded the soundtrack. The show followed the successful format of Stage Three's Rupert Bear Show, in that the hour-long script was split into 4 separate scenes with a Comedy Magician providing some magical interludes between scenes. 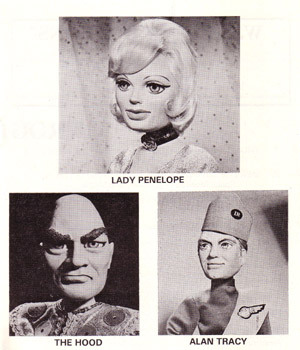 The voice of Lady Penelope was recorded for the Stage Show by Sylvia Anderson's daughter, Dee Anderson. Parker and Brains were voiced by Jimmy Jewel's son, Kerry Jewel and the other voices were recorded by Malcolm Storry and David Schofield. After its opening in Chelmsford, the show moved to the Woodville Halls in Gravesend, to great success and then to the Pier Theatre, Bournemouth for the main Summer Season, opening on 17th June 1974. Rather surprisingly, given the enormous popularity of the TV series, combined with the high quality and excellent reputation of Stage Three's productions, audience numbers for the Summer Season were very disappointing. Sadly, the Bournemouth season was curtailed after only completing the first month. The tour venues already scheduled to follow Bournemouth - Bedworth, Nantwich and Gloucester - went ahead and in those venues, the show was again hugely popular and critically acclaimed. However, news of the unsuccessful Bournemouth venture badly hit the future marketing of the show to Venue Managements and following the show's performance in Gloucester in April 1975, no further bookings could be secured. 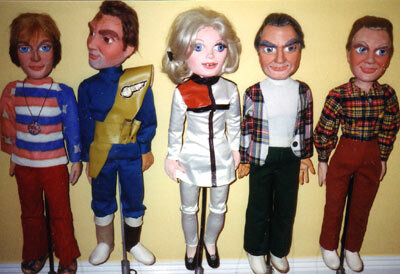 Below is a recent photograph of some of the surviving Rod Puppets from the Thunderbirds Stage Show - still in remarkably good working condition. 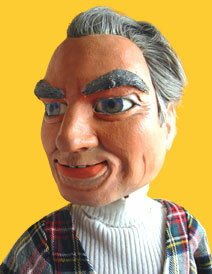 Jeff Tracy (Close-up on Right) is currently on display in the Douglas Hayward Puppet Collection at the Staffordshire County Museum, Shugborough, near Stafford. These puppets are much larger than the original marionettes on which they were based. The head construction is similar to that of the marionettes - with side-to-side moving eyes and moving mouths with a leather insert below the bottom lip. The hands are in thin latex over a wire frame.